For the past couple of months I’ve been writing this blog to share some of my thoughts and feelings about studying abroad in Rio de Janeiro. When I chose to study at PUC-Rio, Brazil was witnessing some of the largest protests the country has experienced since the early 1990s. The country’s middle-class went out to the streets to demand cheaper public transportation, better public services, less corruption, and an end to excessive spending on international mega-projects. As soon as I came to Rio de Janeiro people back home and in Richmond began asking me about the protests – especially whether I was attending some of them. My major, focusing on social justice and political movements in Latin America, strongly influenced my decision to move to Rio de Janeiro during such an important period in the country’s recent history. I suppose friends and family expected me to attend these protests, but as a matter of safety and based on some personal ideas on social movements I decided not to attend. I still wanted to find a space to interact with some of the political actors in these protests. I’ve been studying Brazilian politics and I could not ignore the largest socio-political movement that has impacted the country since the severe political crises of the 1990s. My host mother was not particularly interested in anything related to politics, so I turned to my host University. Early in the semester I met some people studying Political Science, Philosophy, and Social Work. I joined them several times for lunch and asked countless questions about the protests, political movements at PUC-Rio, and suggestions to learn more about the current political situation. They were all really interested in the movements and most of them had already participated in at least one protest. I was really surprised that all of them were frustrated at how little political activity and organizing goes on at PUC-Rio. According to them, most student-led political movements originate and develop at public universities. They told me that students’ apathy is a combination of the university’s attitude towards political protests and the socio-economic level of most students at PUC-Rio. I approached some people campaigning inside and outside the university and found several students who were active members of different social movements in the city. From members of the communist party to members of the Catholic Church, the people I met quickly showed me how diverse and little coherent the protests in Rio de Janeiro were. I was truly happy that I had finally found a way to learn about the protests without putting aside my decision of not joining them. I obviously can’t claim that I know much about these social movements. It’s been only some weeks since I began meeting students who participate in these protests. One of the most positive aspects of all of this has been the number of invitations I’ve received to attend several events related to the protests and other political movements. The picture I’m attaching to this entry is from a student-led debate on police brutality. For privacy reasons I’m not describing each participant in the panel but I wanted to show you how PUC-Rio can be a useful space to learn about Rio’s politics. I’m not entirely sure what the future of today’s social movements in Rio de Janeiro will be. For now, I’m incredibly glad I met several students who were willing to teach me about the recent protests and to share with me some of their hopes for the near future. 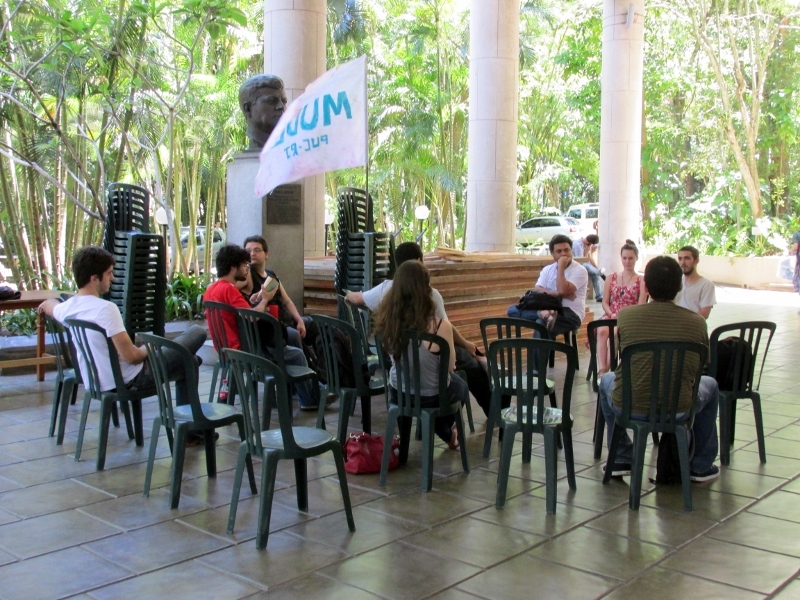 An incredibly interesting debate at PUC-Rio on social protests. As the time to leave Brazil approaches I have been thinking about writing about my host family. To give you some background information, PUC-Rio offers its exchange students the option of living with a host family during their time in Rio de Janeiro. You apply to the program and about 10 days before your arrival to Brazil the University sends you an email with information on where and with whom you will be living. To be fully honest, it made me somewhat nervous not knowing where I was going to be living during my study abroad time. PUC-Rio does not guarantee that everyone who applies to the program will be placed in a host family. In my case, luckily PUC-Rio did place me in a host family. There are many stories I could write today, but I think there is only one way to truly transmit what my experience living with a host family has been. Throughout this semester I’ve sometimes written about my “host family” in this blog. But the reality is that I live in the apartment of a single woman (I’m not mentioning anyone’s name in this post) who now rents two rooms to students. When I first moved into her apartment two other exchange students at PUC-Rio (one from Germany and one from Morocco) also moved in with us. After about a month they both decided to move to a new apartment so it was now only my host mother and me. We had an empty room in the apartment for about two weeks until a new Brazilian student doing a Master’s degree at PUC-Rio came to live with us. Since then it’s been the three of us. Up until a month ago when friends or family back home asked me about my host family I used to say that I didn’t really live with one. I had some great conversations with my host mother but that was about it. I rarely saw the other Brazilian student. This has been the third time in the past five years that I have had the opportunity to be hosted by a family in a foreign country, so probably my expectations were too rigid already. But this all began to change a month ago. My schedule at the university changed and I now had more time to be home. The Brazilian student finished the first half of his thesis and he decided to take a two-week break from work. My host mother quickly realized that we were both going to be spending much more time at the apartment, so she proposed to have dinner together at least some days during the week. By the second dinner we were all sharing incredibly personal stories. Put two young students who live far away from home and a friendly older woman who loves to talk together and you just created a great conversation. We talked about everything from food and the World Cup to work and love. But there was one particular topic that always seemed to dominate the most intimate moments of our conversations: family. Maybe my “host family” experience in Brazil was not what I expected. Personal situations in each of our lives deeply impacted the atmosphere in our apartment. Sometimes we became three strangers living in the same apartment, and sometimes we became a small family: three people from incredibly different paths of life who gradually moved closer to each other. And even if I were to leave Brazil and never talk to them again, our conversations about family were a true gift. For one reason or another, we all found ourselves far away from our families. Our dinners became a space to share memories, frustrations, dreams, and hopes about those who were either waiting for us back home or had left home already. The other student and I projected our current family situation to the future and imagined perfect scenarios. We also laughed at how my host mother’s ideas of family had changed throughout her life. I’m still not sure what to answer when someone asks about my host family. But for many reasons, my time in Rio de Janeiro ended up being strictly connected to the idea of a family. And that, I would like to believe, is what I will take with me once I return to Richmond and Guatemala. 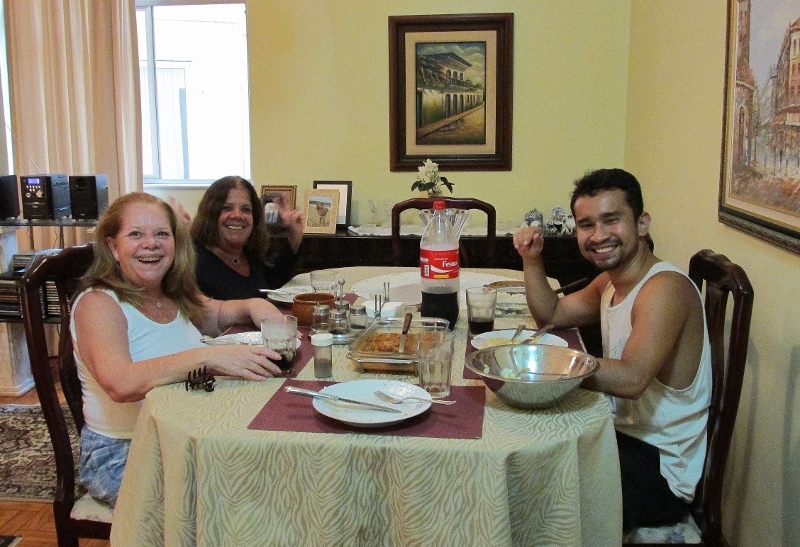 I took this picture about a week ago when we received a guest (my host mom’s sister) for one of our dinners. Main topic of the night? Family, of course. Yesterday I had my first final exam at my host university. I would not say that my time in Rio de Janeiro simply flew by, but I certainly feel that the second half of the semester was somehow much shorter. It seems as if just two weeks ago I was writing my mid-term exams. Yet here I am, about two weeks away from closing this experience abroad. 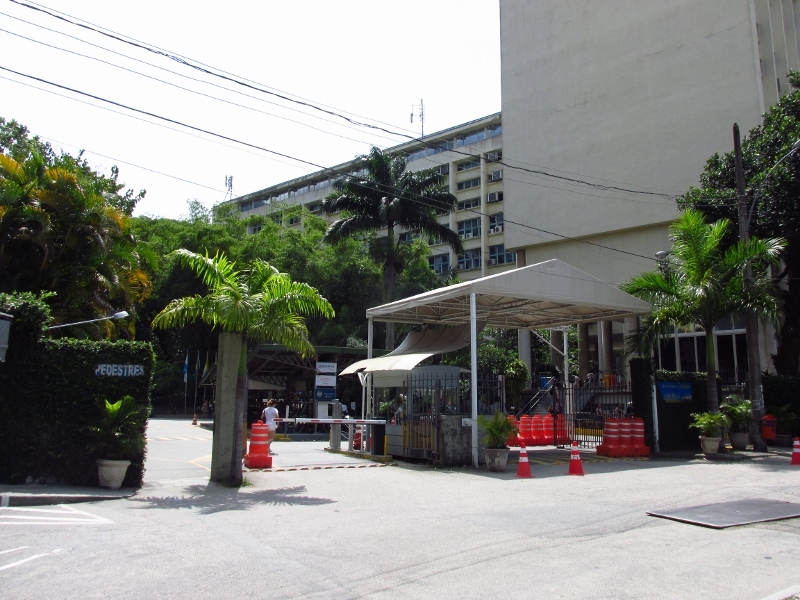 As with my post about mid-term exams, I am posting pictures of PUC-Rio’s campus. This time I took two pictures right outside the main campus entrance. The main entrance to PUC’s central campus. Several public buses either go through or end their routes right in front of these doors, making the campus quite accessible. This week I wrote my Portuguese final exam. It was incredibly short and I suppose PUC simply wants to test how much its foreign exchange students are learning. Rather than bombarding us with fifteen or twenty exercises on the same topic, my professor asked us to complete about twelve sentences in total that tested whether we can use different tenses and conjugate verbs. She also gave us a short reading and asked us to answer two short questions. Tomorrow we will have the oral section of my exam in which we will discuss racism in Brazil. All of my other classes (Geography of the Contemporary World, Political Economy of Latin America, Brazilian Foreign Policy, and Poverty and Social Inequality) are mainly based on academic readings. Final grades in each class heavily depend on how students do in final exams, so I suppose my professors will be asking for two or three long, essay-type answers for each exam. Interestingly enough, my four classes (or maybe my four professors) have different approaches to tests. Today my Poverty and Social Inequality professor distributed six essay questions for us to prepare at home, each relating to a particular text we read during our course. For our exam she will choose three of the six questions and ask us to develop a relatively long response for each. While this may seem rather simple, she expects us to incorporate our in-class debates into our responses, turning our exam into quite an interesting exercise. My Brazilian Foreign Policy class will also have a “traditional” exam. We will be given three essay prompts that ask us to compare different authors, theories, and historical periods. This will certainly be my heaviest exam in terms of the amount of content I will need to prepare and study. Luckily, this has been my favorite course at PUC-Rio and it will be quite interesting to look back and realize how much I have learnt about Brazil and Latin America through this class. The exciting moments of my next two weeks will most likely come during my Geography and Political Economy exams. These two professors have a very interesting approach to final exams. They both believe that having students simply reproduce what they have already read in academic texts does not show how much they have learnt. Instead, we will be given a newspaper article (or an image in the case of Geography) to analyze using the theories and arguments we have studied so far. My professors’ objective is to determine whether students have developed the skills to put new knowledge in practice. This was probably not the most entertaining post of my semester, but I wanted to give you an idea of how different academic systems may be abroad. About 60% of my final grade for each class will be based on these exams. My experiences at the University of Richmond and at PUC-Rio have been different in this aspect, yet I am confident both systems have allowed me to learn immensely. I will definitely let you know how my exams go! But enough of that. The presentation went incredibly well and I’m happy to feel capable of improvising and analyzing Brazil’s involvement in Latin America during the Cold War in front of a large group. How did it happen? I’m still not entirely sure, but the topic is so interesting that I decided to share with you some history that has traditionally been ignored. Read any history book on the political landscape of Latin America during the late 60s and early 70s and you will most likely be led to believe that Brazil played an almost-insignificant role in other countries’ politics. Historians and political scientists have typically pointed at the US for its involvement in the region as a hegemonic power interested in sabotaging any left-wing political victory in Latin America. A different language, culture, and history of colonization are all factors that have led us to conclude that Brazil hasn’t really focused its Foreign Policy on Latin America. While most of the above may be true, it turns out most books won’t be precisely teaching you what really happened between 1965 and 1975. Brazil’s former president Médici – military dictator between 1969 and 1974 – believed that the ideological war in Latin America at the time was an internal conflict, consequence of the poverty and inequality that have historically characterized the continent. Médici concluded early in his time in power that any solution to the region’s ideological war would also have to be internal. 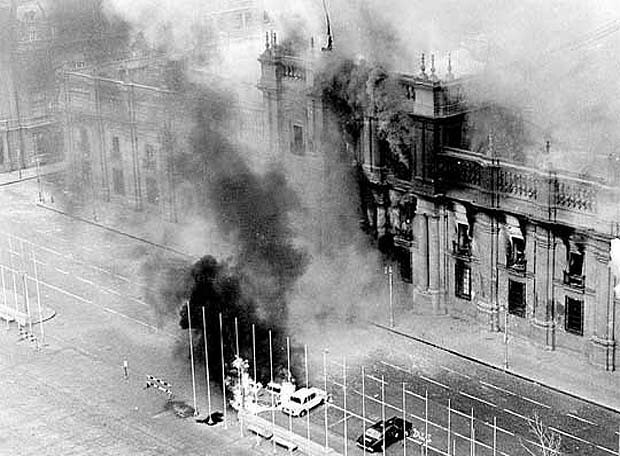 During his administration Brazil participated in the overthrow of a democratically-elected leftist president in Bolivia, the weakening of Uruguay’s most important leftist coalition, and the training of military forces that would eventually overthrow Salvador Allende in Chile. A number of internal and external factors led Brazil to shift its attention away from the region after 1974. Pinochet in Chile and Geisel in Brazil would lead, respectively, the two countries on different paths towards a harsher military rule and more relaxed policies. It wasn’t until the 1990s that Brazil would regain such strong interest in Latin American politics. Next semester I will start writing my thesis back in Richmond. I have decided to give a more historical touch to my examination of the Brazilian-Peruvian international border in the Amazon region. As it turns out, Brazil’s involvement in Latin America has been much more important than what I once thought. Among all of the academic lessons I have gained while studying abroad in Brazil, this may be the one that will have the greatest impact in years to come. 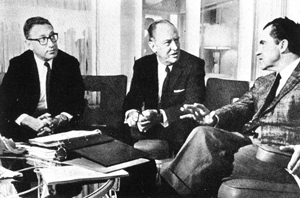 If you are interested in reading more about Brazil’s involvement in Latin America between 1970 and 1975, you can follow this link (http://dx.doi.org/10.1080/14682745.2011.641953) to the article by Tanya Harmer (2012) that was the basis of my presentation and this blog entry. It’s been exactly three months since I first came to Rio de Janeiro. Before starting my study abroad program I had spent the last half of July working in Lima and the Peruvian Amazon. On August 5th I finally took a bus to Lima’s airport and flew during the night to the Galeão International Airport in Rio. Just yesterday I was having dinner with my host family and we talked about that first day when I moved into their apartment. Three months and today is the first day I post an entry about a trip in Rio! As I have written several times before, one of my main goals for my program was to avoid becoming yet another tourist in this city. I understand why many friends tend to disagree with my goal, but having this objective in mind was a mix of previous experiences in other regions of Brazil, some geography and sociology classes, and the desire to have a different approach towards one of the world’s most dynamic metropolis. 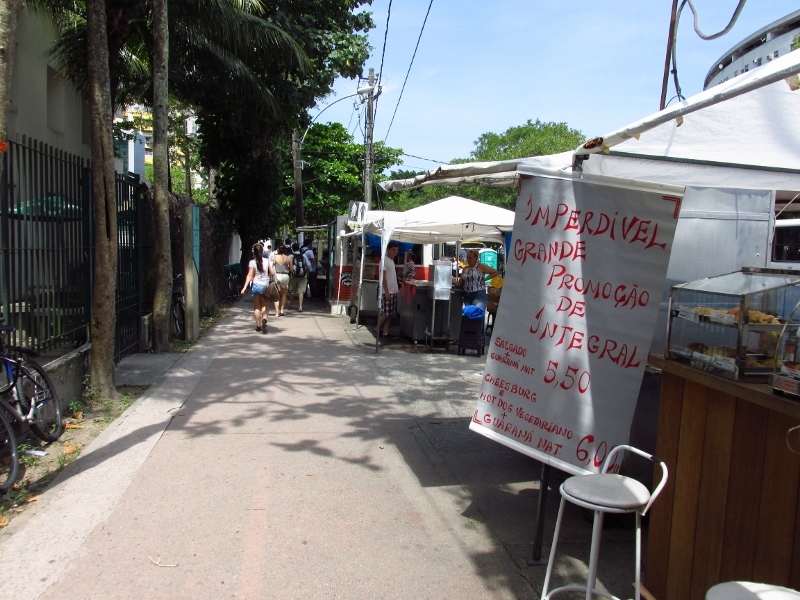 After countless conversations with my host family, classmates, professors, and many people I have met so far, I finally felt ready to visit and write about some of Rio’s neighborhoods. So here it goes. Last weekend I packed a backpack and left my apartment early in the morning. I took a bike (every month I pay about $4.00 to have access to one of Rio’s biking programs) and began my trip to a neighborhood in Rio’s southern area: Ipanema. I had planned to visit a number of places that my host family had suggested, but I mainly wanted to spend a day walking around Ipanema’s streets without a set destination. 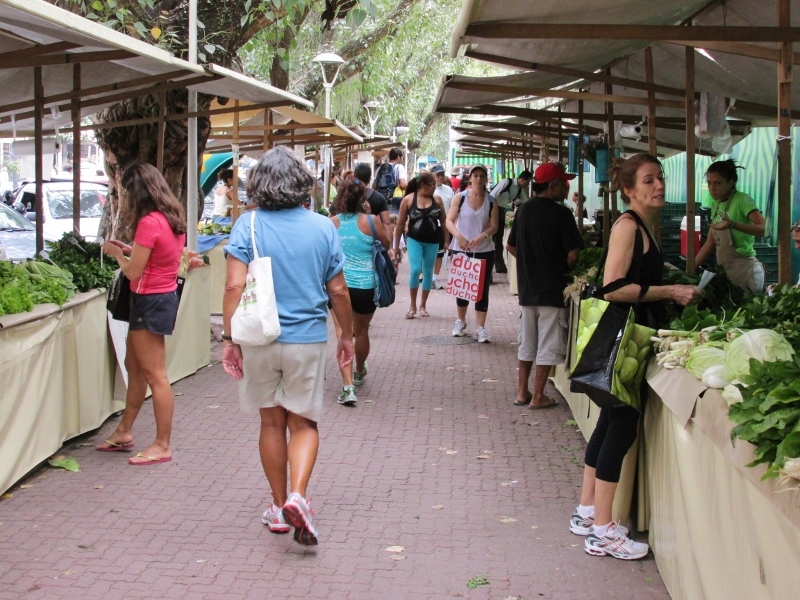 A small market with great fruit in Ipanema. I biked for about 25 minutes before reaching Ipanema and left my bike to start walking. My host family truly wanted me to visit the Praça Nossa Senhora da Paz and the Igreja Nossa Senhora da Paz, so that is where I went first. Thinking about this entry I stopped to look for “good” pictures but in the end decided to submit the ones with cars, buses, and people walking through the church and park. In my experience, contrasting images of nature, people, and culture is one of Rio’s main characteristics. 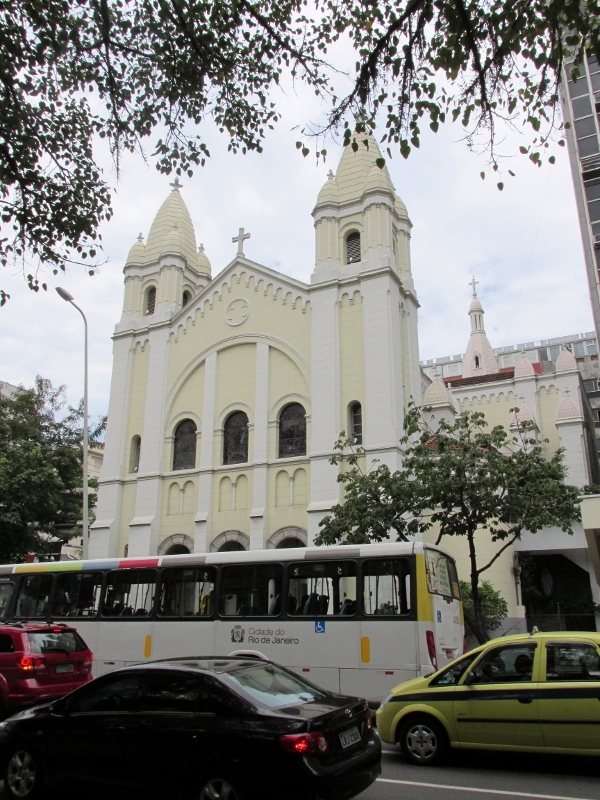 Not a great picture of the Nossa Senhora da Paz church, but the contrast is certainly common in Rio’s streets. I bought two oranges from a street market and sat in the park to read “Perto do Coração Selvagem” (Near to the Wild Heart) by Clarice Lispector – a fantastic writer. Unfortunately it was a rainy day so reading outside was not a great plan. I entered a small shop to buy water and asked if they had any suggestions for my trip. The guy in the shop sent me to visit the theater Rubens Correa and the cultural center Laura Alvim, and of course I followed his instructions. As I visited these and other places I kept asking people if they had any suggestions for my day in Ipanema. I ended up having lunch in a sandwich-shop with incredible natural juices and a nice couch to read. I finished Lispector’s book in the afternoon and kept walking. The weather had not improved much but several people were now in the beach (my guess is that the temperature never dropped below 70 degrees.) I knew friends and family would appreciate a picture or two from Ipanema’s beach so I walked by the beach for about forty minutes. When I finally reached the end of Ipanema (where Copacabana starts) I took another bike and began my trip back to my apartment. 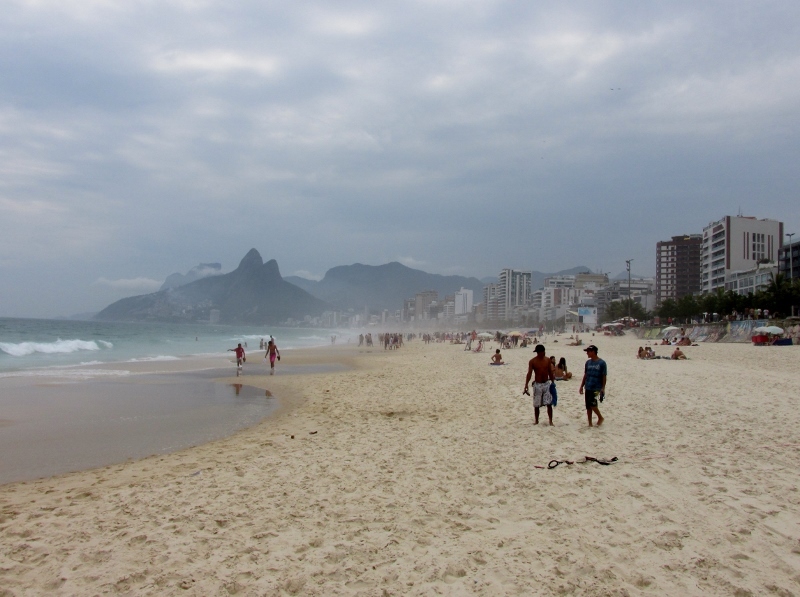 And of course, Ipanema’s beach on a cloudy day. As I walked through this neighborhood I kept thinking about my “don’t be a tourist” goal. Was it worth it? Did it make any sense to wait some time before going on these trips? Would reading Lispector’s book in a sandwich-shop have been any different two months ago? Well, I suppose any “evaluation” of my goal will have to come from my overall experience in Rio de Janeiro. Two months ago I wouldn’t have known that, following a common cultural dynamic in the country, Lispector’s modern language had been widely criticized throughout Brazil as an attempt to move away from other more traditional styles. It may seem as small detail, but understanding why different literary circles in Brazil reacted differently to “Perto do Coração Selvagem” is the result of countless conversations during these three months.